My husband North first became obsessed in December of 2005. He was spending Christmas with me at my parent’s home in Tallahassee for the first time. While the visit itself held lots of good memories, it was his first bite of the world’s best rum cake that seems to stand out most vividly in his mind. The world’s best rum cake, unassumingly wrapped in aluminum foil, has been given to my parents as a Christmas gift for years now. In a move which is not surprising , considering the history of this type of deceit in my father’s family (see my post on Granny Ivey’s Strawberry Roll for details), as children we were never told how delicious this cake was. In ignorance, we nibbled on sugar cookies while my father slowly savored the rum cake by himself. During North’s first Christmas visit, in what was truly a generous move on my father’s part, he offered a piece of the rum cake to North. I can only imagine his dismay when he saw that North coveted the rum cake just as much as he did. North flew out on an early flight that year and when my mother cut him a piece of rum cake for his flight, my father grumpily asked that she cut North’s piece a little smaller. He was not used to sharing. Since that first Christmas, North eagerly awaits the Christmas rum cake and I too have developed a love for it. At home, I’ve tried to replicate the recipe although with less than desirous results. The first rum cake I made was so boozy that it served as an after dinner drink and dessert in one. You might be wondering why I don’t just ask for the recipe. There are two reasons. First, I would be so disappointed if she told me no. Second, if I made the world’s best rum cake, I wouldn’t give out the recipe either. I know…a little hypocritical on my part. But honestly, I would prefer to happily hold on to the secret while the recipients of my baking prowess did their best to stay in my good graces for fear of losing their annual Christmas gift. Yes, this would be power. While I haven’t replicated the cake yet, I did come up with this recipe which is pretty darn good, if not the best in the world. 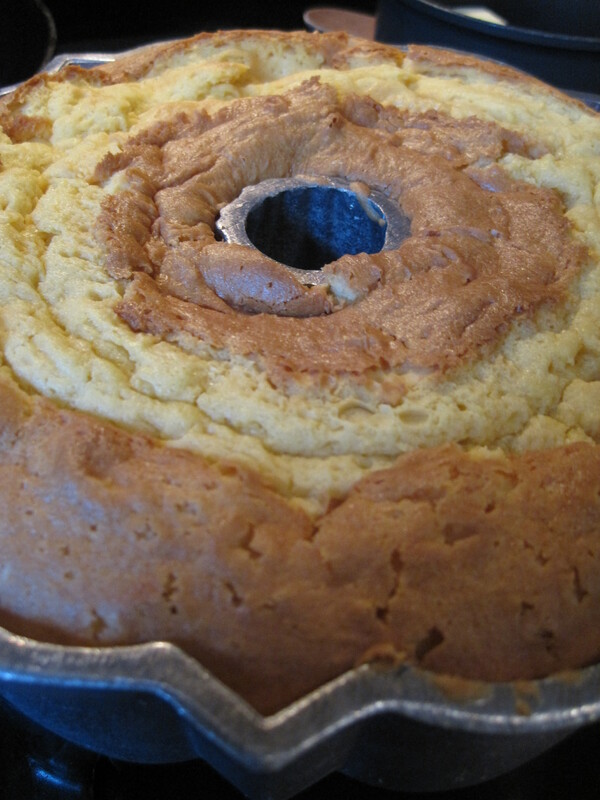 In what was obviously a slip, I learned that the maker of the worlds’ best rum cake used yellow cake mix in her recipe. The brand of cake mix remains a secret, but the tip has at least allowed me to narrow down the recipes that I have attempted. In doing so, I’ve found that instant pudding mix is another secret. Before you scoff at the use of not one, but two boxed mixes, give this cake a try. It’s extremely moist, also elegant, and won’t last long. In the meantime, I’ll keep on searching for that holy grail of rum cake recipes. While certainly not the world’s best rum cake, this recipe is the closest I’ve come to recreating it. 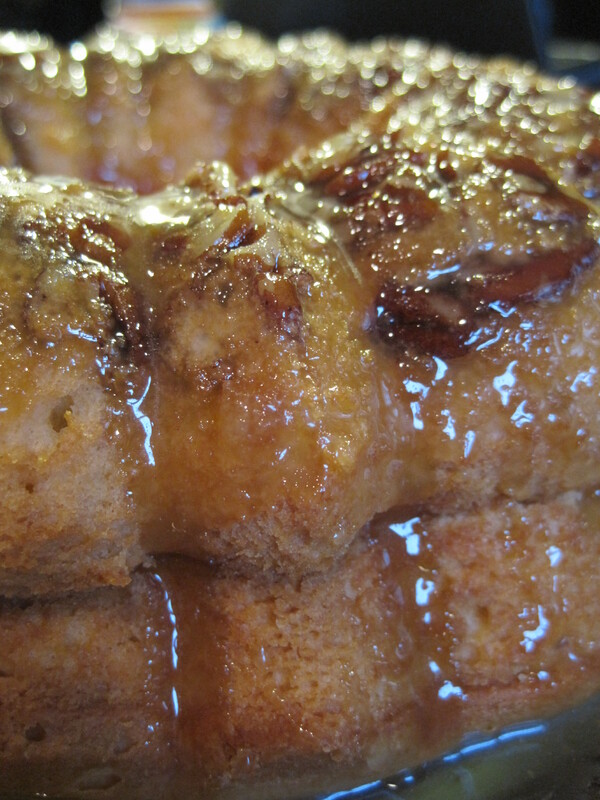 Do you have your own rum cake recipe? As I continue my search, I would love to see it. Preheat oven to 325 degrees. Grease a 10” bundt pan. 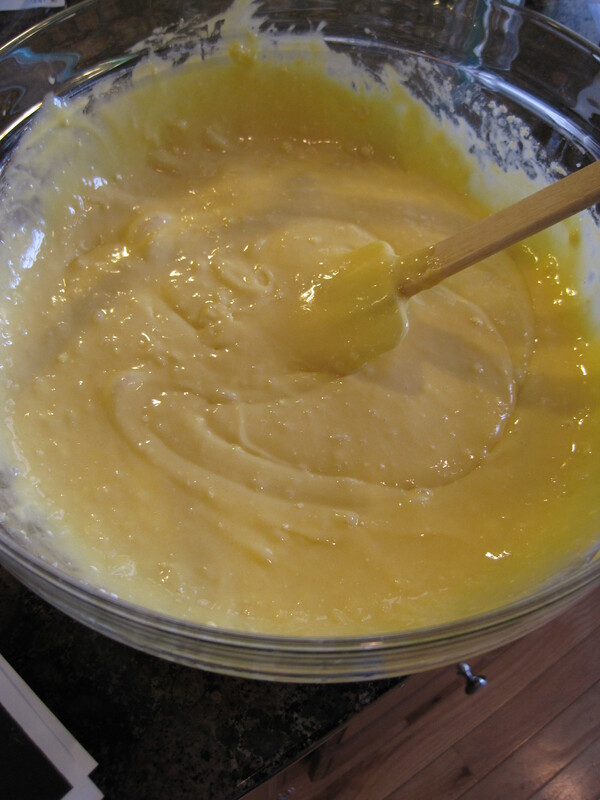 In a large bowl, whisk together the yellow cake mix and the instant vanilla pudding mix. Add the eggs, cold water, vegetable oil, and dark rum. Stir the mixture until smooth (you will really have to use your arm muscles to get out all the lumps). 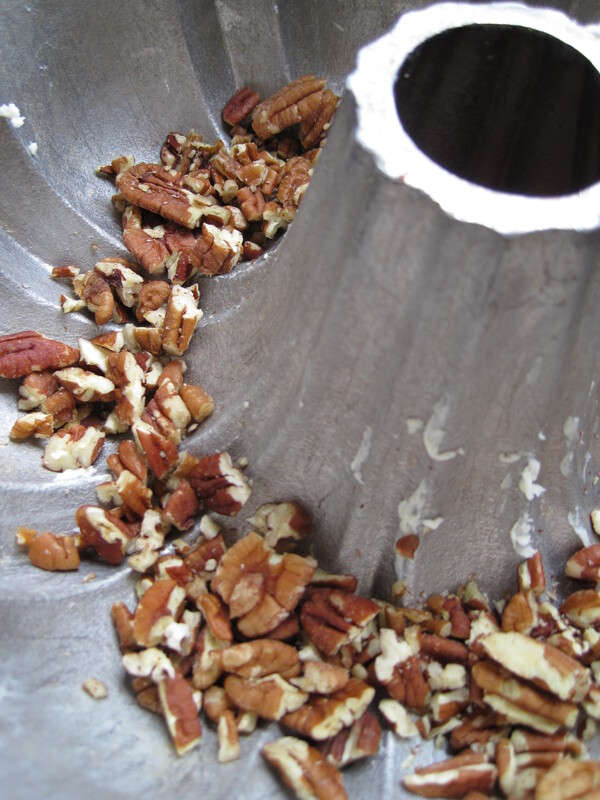 Scatter the chopped pecans evenly on the bottom of the greased bundt pan and then pour the batter over the pecans. Bake for 1 hour or until a toothpick, when inserted into the cake, comes out clean. 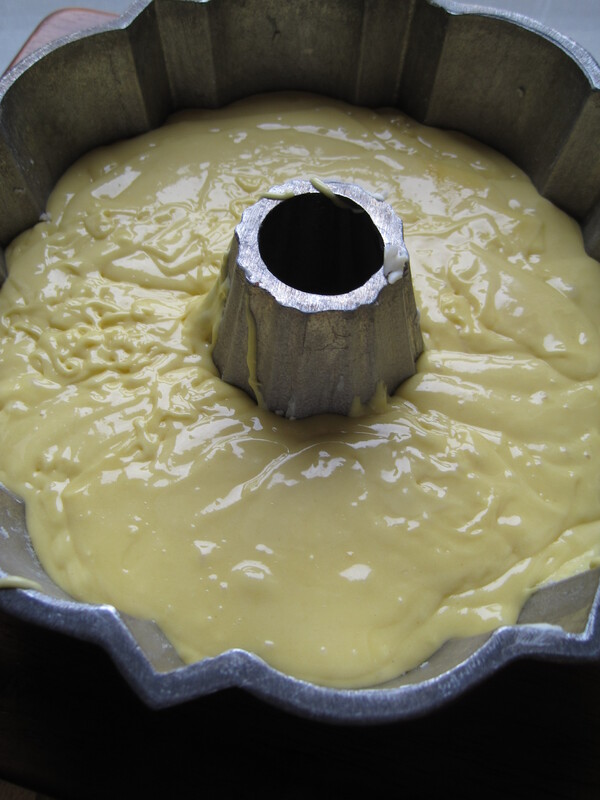 During cooking, the cake may rise above the bundt pan. If this happens, when you take it out of the oven allow it to cool slightly before gently pressing the cake down. Cool the cake completely before adding the glaze. For the glaze, melt the butter in a saucepan. Mix in the water and sugar and boil for 5 minutes stirring constantly. The mixture may start to bubble over so watch it carefully. Remove the pan from the heat and stir in the rum. 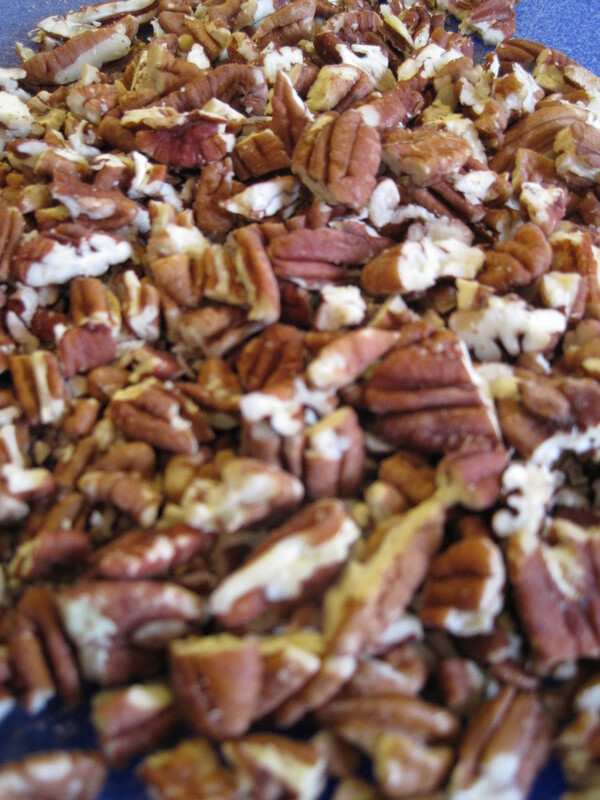 Invert the cake (so the pecans are on the top) on to a serving plate. Using a toothpick stick holes into the cake then drizzle the glaze over the top a little at a time. Let the glaze soak in before adding more glaze. I work as an RN with your Dad and made your cake the other day to bring in to work. He thought it was definitely the best rum cake ever! But you are right about him not wanting to share and being grumpy when others wanted a piece. I guess i’ll have to make him his own next time. P.S. The entire staff LOVED this cake cake. I’m so glad you not only made, but also liked the cake. As for sharing it with my father, you are a brave woman. He’s a different man around rum cakes! I made your rum cake last night for Derrell and he LOVED it 🙂 I left it as a surprise at his place, but I can’t wait to try it myself tonight! Thanks for posting such fun recipes! 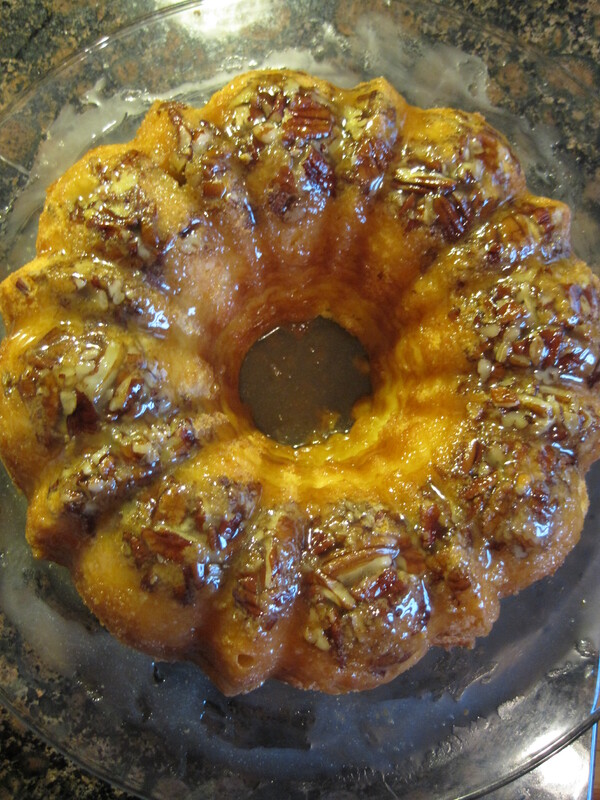 Great to hear from you and I’m delighted that the rum cake was a hit! It is pretty darn good! I presume the “other” famous cake you refer to is Barbara Storey’s? I had one, it’s really good — but very different from what I’ve ever had (it’s the mushy, soaked type). Tortuga is in fact a cake mix that is doctored, along with a lot of BS marketing about some old family recipe. Another key ingredient I think you might be missing is that most of these cakes use artificial rum flavoring in the mix to accent the taste. The recipe above is about the same that’s on the back of the McCormick “Rum Flavoring” box. I tried it, it is nice… close. But I’m still feeling (tasting) something missing. Once I get a really good, reliable recipe, I’m going to try adding cocoa, banana, etc., to see what variations I can make. Glazing is a process. If you put on too much, it’s mushy, if you don’t thicken the glaze enough, it’s mushy. Too much booze and, as you’ve found, too boozy. I would certainly ask my mother for the recipe if she knew it, but she doesn’t. It was always given to my family as a Christmas gift growing up. I suppose I could seek out the giver of the gift and beg for the recipe, but I respect secret recipes and like the challenge of figuring it out for myself. The rum extract is an interesting idea – I’m in favor of the real deal, but it’s a nice option particularly when the booze becomes a little overpowering. Thanks for reading! I’m trying this for a after dinner Christmas Day treat. I’ll let you know how it turns out. Your pictures made my mouth water. I used to live by a little old lady who would make rum cakes every so often and then share the moist, rummy goodness with me. I never thought to ask her for the recipe. Doh! Know what you think! Happy cooking. This rum cake was a total hit yesterday! So moist and not too boozy. Thanks for the recipe. It is an absolute keeper in my book!! Sooooo, the question is…what does your Dad think about this recipe? Great question! He has the original nearby so I have actually never made this wannabe version for him. I think that needs to happen though – I am sure he won’t mind!